Who doesn't love eating a wonderful meal at Red Lobster? But my hubs and I enjoy the biscuits more than anything. My mouth starts watering just thinking about them! Well, the other day I needed to add something to a meal I threw together last minute (yes, I do lack dinner planning occasionally...2 or 3 nights a week!) and was really craving that cheddar, garlic, buttery goodness that grace those soft, wonderful biscuits. So, I set out on a quick search and quickly found many versions of the recipe, but guess what? Every single one of them required Bisquick. This girl doesn't have Bisquick in the house! Well, because it is just basically self-rising flour in a box, that's why. 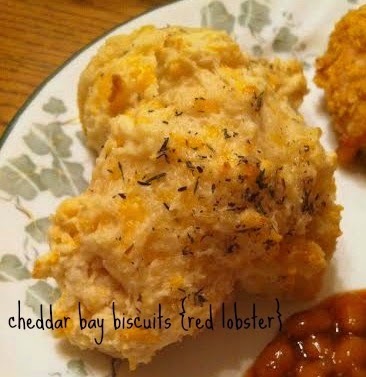 So here you go, you fellow Cheddar Bay Biscuit lovers. A recipe that you can make with self-rising flour. Guess what? Just add some baking powder. For every cup of flour, just add 1 1/2 teaspoons baking powder if you don't have the self-rising on hand. The end result won't know the difference, so nobody else will either. Seriously. Because they will be inhaled within moments of setting them on the table. Place the flour and salt in a mixing bowl and toss together with your fingers. Cut in the cold butter and using a pastry blender, blend until small peas form. Add the shredded cheese, milk and garlic powder and mix until combined (use your hands or a wooden spoon). Drop the dough by heaping spoonfuls onto a greased baking sheet. Meanwhile, add the garlic powder and parsley flakes to the melted butter. Bake for 10-14 minutes, or until tops or lightly browned. Immediately brush the biscuits with the melted butter after removing from the oven.